CooksRecipes has quality, kitchen-tested recipes for a variety of pumpkin pancakes that you can count on for successful deliciousness. 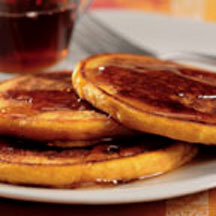 A burst of pumpkin and orange flavor in each bite, these moist and fluffy pancakes make a great breakfast treat. 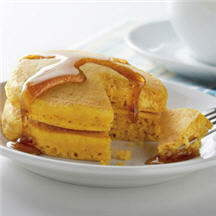 These easy to make pumpkin pancakes are beautifully golden in color and have a fun "puffed-up" appearance. 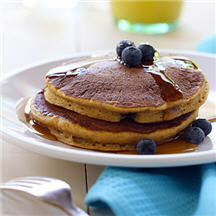 Whole-wheat flour, pumpkin and blueberries are combined to make nutritiously hearty, yet deliciously light pancakes.